As seen above, dissociation is an empirically established phenomenon known to occur in experiential space, which can lead to the formation of co-conscious alters. And since TWE is universal experiential space (Inference 3), it is empirically coherent to posit—as Inference 4 does—that top-down dissociation leads to the formation of discrete but concurrently conscious centers of experience within the otherwise unitary TWE." This sums up Kastrup's ideas on DID. Now let's break this down. 1. Consciousness is the one and only certainty, you know "I exist" is true and cannot be false. 2. Disassociate Identity Disorder occurs in consciousness. This is an empirically proven fact as Kastrup discusses above. In DID each identity is real and somewhat autonomous, to the point where the identity can control the physiology of the body (such as the blind woman above). The identities coexist but are equally real. 3. So, it is possible individual minds : consciousness itself :: alters : individual minds. 4. Whatever "matter" is, it correlates with DID in consciousness itself. In other words, alters of consciousness itself are within "material" bodies. 5. Therefore, it is possible that foundational consciousness created matter, intentionally or otherwise, to create alters (other conscious beings). Now, let's go through and look at the explanations/defences of all this. 1. Self explanatory - "I exist" cannot be false. We know consciosness directly and axiomatically, and everything else including matter and other minds are known through consciousness. 2. #2 is simply scientific fact. 3. There must be consciousness itself (the Form of it) and then also individual particularizations of consciousness. Like DID occurs in particularizations, perhaps this is what is happening in the Form of consciousness as well. This would make every conscious mind a particularizations of the Form of consciousness. 4. Individual particularizations seem separate from the Form of Consciousness by what we know as "matter". Different particularizations exist in different bodies, some having DID themselves. It seems bodies are necessary to create an alter. 5. There are two possibilities if we go this route. First, consciousness could also come with a subconscious, the latter of which creates matter unintentionally. Second, the Form of consciousness may have intentionally created alters. - matter can be seen as training wheels for consciousness/the alter to grow and individuate. - we can still differentiate between mind and matter. - allows for a type of idealism without completely ignoring mind/matter divide. - explains the mind/body problem in an evidence way that does not contradict logic. - explains how we can be OF but not IDENTICAL TO Set/Consciousness. - gives insight into Set's wants, such as other individual conscious beings. - puts god/Horus in his place below Set. - allows for flawed gods and imperfect nature. - possibly removes the need for a demiurgic force. - explains why isolate consciousness needs to be strengthened (to not be absorbed back into Set). It's weird, I was just reading about this exact same thing a few hours ago. That's some interesting line of thought. Not entirely different from my consciousness-based pantheism. 2. Disassociate Identity Disorder occurs in consciousness. I wouldn't say it occurs "in consciousness" but that it means that more than one consciousnesses are connected to the same body and sometimes to parts of the same mind. 3. There must be consciousness itself (the Form of it) and then also individual particularizations of consciousness. Why must there be a form of something? Unless of course we believe in spirits. But yes, if any, if you are in a body it is much easier for you to be noticed to be a conscious being by other embodied people than if you aren't. Hm, you seem to be conflating mind and consciousness. Which of the two are you saying might be creating matter? I suppose this doesn't eliminate dualism. Matter could still be another substance interacting with consciousness. Very interesting, I'll have to ponder that for awhile. I’m having a hard time seeing why it would be necessary for consciousness to create matter for this to work. If one wants to experience something like DID, look into tulpas. There is a community of people who spend their time creating alters that they call tulpas. Common techniques for creating them involve meditation, hypnosis, visualization, among other things. The community around it is an… interesting bunch to say the least. Some might find it worth reading even if they don't create a tulpa. Many people also create a wonderland, a world to explore in their subjective universe with their tulpa. If you do decide to give it a try, there are some hypnosis videos on youtube that are helpful. I've played around with this some, and once I started having success, I realized I wasn't comfortable with the idea of permanently sharing my headspace with another consciousness that could potentially grow to be as strong as me, with her own wants and desires. Or at the very least, I was not ready for such a commitment. So I apologized for bringing her into this world, stopped thinking about her, and let her dissipate. The neural pathways formed from this have been quite useful though, making it easier to have the experience of interacting with deities, servitors or other entities when I choose to do so. 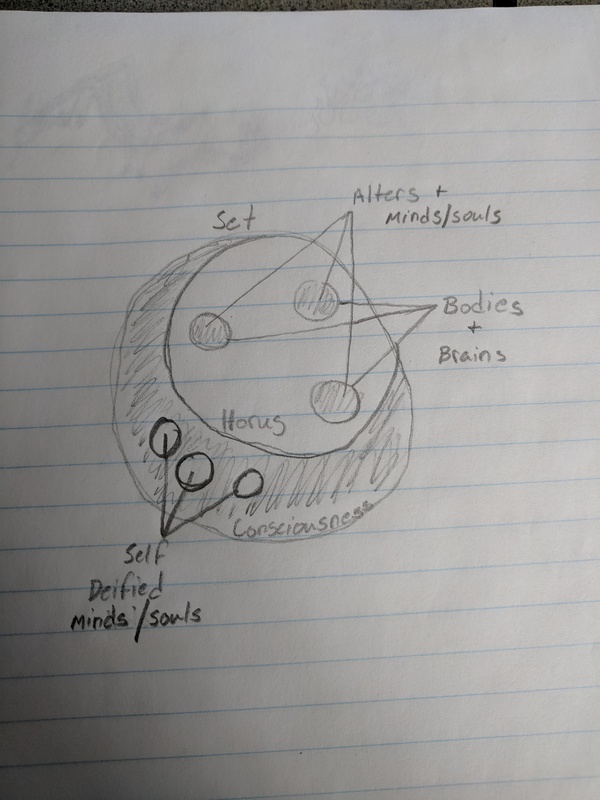 Yesterday I conjured up a yoga instructor servitor to help guide me and evaluate my technique. Mind definitely can't be consciosness as it includes the unconsciousness. As for forms, I'm not sure if they HAVE to exist or not, I'd say it's more illustrative than directly descriptive of Set's nature. Perhaps there isn't actually matter at all? Or again perhaps matter is demiurgic in nature and meant to limit and trap isolate consciousnesses? From what I understand of the boundaries presently being pushed in obscure branches of physics, some people who've educated themselves thoroughly and thought hard on the topic make a compelling case that the behavior of matter as we know it could be fully explained by considering it an artifact of mind. In that case, it remains an interesting question to investigate how so many apparently independent sources of thought manage to divvy up control over matter, and why it appears that no individual has managed to seize complete control over all "matter" yet. Answers about how those checks and balances work tend to double as suggestions for how to circumvent or get advantages over them. I do find it quite useful to occasionally examine the world through the lens in which all matter is a lie and illusion, in order to seek errors in my assumptions about my own limitations. I'm reminded of the robot vacuum which uses a distance sensor to turn before it collides with any infrared-reflecting object. This heuristic is fantastic for minimizing the time it spends hitting walls, but will cause it to falsely turn back from a low-hanging curtain which it could drive straight through if it explored its world by touch instead. Just as that vacuum can learn something new about the boundaries of its environment by disregarding those distance sensor readings in favor of the touch sensor ones, so too can I occasionally profit from setting aside my assumptions about the correctness of my usual perceptions of the world. However, just as the vacuum can usually achieve its goals faster and with less damage to its chassis by trusting the distance sensor readings, I also find that it benefits me to trust my assumptions about the world rather than testing every one of them in most circumstances. ...As for forms, I'm not sure if they HAVE to exist or not, I'd say it's more illustrative than directly descriptive of Set's nature. Can forms also be modeled as the basis of worldly communication between what appear to be disparate entities? Or is assigning a Form simply prerequisite to our ability to reason about and modify a concept?